Amidships: The center or middle of a canoe. Beam: The width of the canoe, typically provided in three measurements: waterline, gunwale and maximum width. Belly: The bottom of the canoe. Bilge: The point of greatest curvature between the bottom and side of a canoe. Bow: The front end of the canoe. Chine:Where the curving sides of the hull gradually merge into the bottom. Depth: The distance from the top of the gunnels to the bottom of the canoe when measured at the beam (sometimes called center depth, as opposed to the depth at the extreme ends of the canoe). Draft: The amount of water a canoe draws. Entry Line: Shape of the bow where it cuts through the water. Flare: Occurs when the sides of the canoe are wider above the waterline, particularly at or near the gunwales. Flotation: Buoyant material set into the ends (or other panels) of a canoe to make it float if upset. Freeboard: Distance between the gunwale and waterline at the lowest point. Foot-brace: A wood or metal bar against which a paddler braces his or her feet. Foot-braces help secure the paddler in the canoe and so add to the efficiency of his or her strokes. Fullness: Shape of canoe determined by how quickly the hull widens. A full canoe widens sooner and stays wide longer. Gunnels: Both outside and inside, top finished edges of a canoe. Also referred to as rails. Gunwales: Inside and outside top finished edges of a canoe. Hull: Frame or body of the canoe. Initial/Primary Stability: Steadiness when upright and paddled under calm conditions. Keel: External ridge along the centerline of the canoe. Can improve tracking and stability. Keel Line: Centerline of the canoe running from bow to stern along the belly of the canoe. Painters: Ropes attached to the bow and stern of a canoe used for lining or pulling. Rails: The gunwales (gunnels) of a canoe. 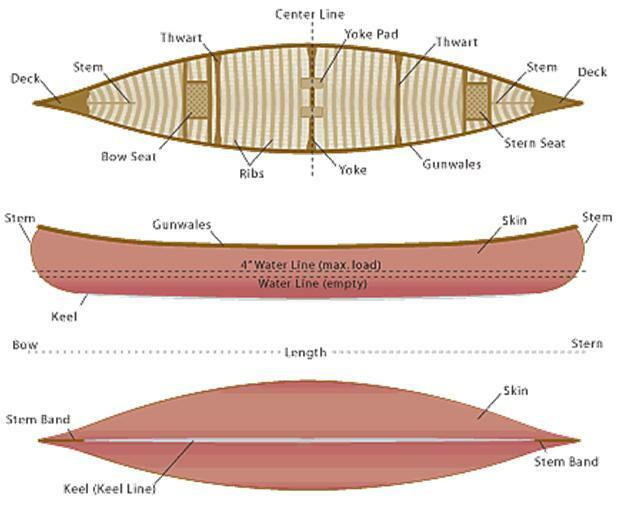 Ribs: Lateral supports which run at angles to the keel on the inside of a canoe. Ribs provide hull rigidity and structural strength. Rocker: Indicates curvature of the keel line. Secondary/Final stability: The resistance to capsizing in wind, waves or lean. Skid plate: A piece of thick Kevlar that is glued to the bottom ends of a canoe. Prevents abrasion of the skin of the canoe. Splash skirt/cover: A fitted cover designed to keep water out of a canoe. Splash covers are useful in rough rapids and big waves. Stems: Finished edge/piece in the bow and stern ends of a canoe. Stern: The rear end of the canoe. Thwarts: Crossbars toward the bow and stern of the canoe. Structurally maintains the canoe shape. Trim: The difference in the draft at the bow from that at the stern of a canoe. A properly trimmed canoe will sit dead level in the water. Tumblehome: The inward curve of the sides of a canoe above the waterline. Tracking: The ease with which a canoe can be paddled along a straight line. Waterline: The place to which water comes on the hull of the canoe when it is set in the water. Yoke: A strong crossbar in the middle of the canoe designed for carrying the canoe on the shoulders. Often includes two yoke pads for more comfort.